The chief executive of a football club and his 10-year-old son were among six people on board a light aircraft that crashed on a golf course in Bucks. 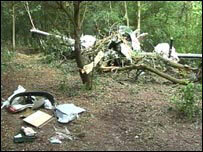 The Cessna 310 came down in woods close to Denham Golf Course on Saturday. 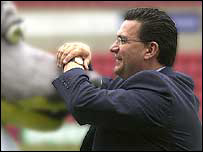 Swindon Town Football Club confirmed Mark Devlin and his son Stan were injured in the crash, as well as marketing manager Mike Sullivan. Also taken to hospital were investor Bill Power, an unnamed passenger and the pilot, 60, who was seriously hurt. The plane had taken off from Denham airfield earlier in the day and was returning from the first match of the season at Hartlepool United when the crash happened shortly after 1900 BST on Saturday. All the injured were taken to Wexham Park Hospital in Slough. A spokesman for Thames Valley Police said members of the public had reported a twin-engine aircraft going down in a wooded area of the golf course. Air accident investigators have been examining the wreckage of the aircraft. Thames Valley Police have handed over the scene to British Transport Police as the accident took place in their jurisdiction.